Cala Junco, situated to the south of Milazzese promontory upon a sandy seabed, is a great landing point in case of winds blowing from north and north-west. In the Milazzese Bay it is possible to moor in 7-8 m of water depth; the bay reveals to be a great harbour in case of winds blowing from north and north-west. If the winds blow from the south the unique sheltered harbour is that of Cala della Neve, situated on the north-western side of the island, next to the Nave rock. The nearing to the harbour is quite safe, but because of the rocky seabed, it is better to use a buoy. 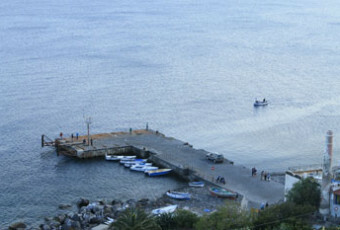 The principal dock is that of Scalo Ditella, situated to the east in proximity of the inhabited centre of San Pietro, where a pier nearly 100m long and 10m large ergs upon a sandy seabed, permitting the landing of hydrofoils, ferries, and the execution of the normal economic activities. The southern side of the pier is only used for hydrofoils. The pier’s header together with the first 5 metres on the northern side are used for a landing and the ferries’ manoeuvres; the remaining parts of the pier at the north id used by fishers and boaters. The pier suffers the winds of the I, II and the IV quadrants, and represents a good shelter in case of winds of the III quadrant. The landing in the range of 200 metres from the pier’s header is forbidden. There are the services of fuel, hydric provision, outside storing, rubbish service, and landing. Furthermore, next to the port area there is the slipway, a floating crane, cashpoint, a drugstore, a grocery, hotels, and Emergency medical Service. For the boaters next to the moor of the island there is a buoy mooring berth with a transfer service. It is better to reserve , especially in simmer period, in order to assure a place. Basiluzzo is a part of the same volcanic complex of Panarea, such as other rocks Lisca Bianca, Dattilo, Bottaro, Lisca Nera, Panarelli and Le Formiche, which seem to form a stand-alone archipelago between Lipari and Stromboli. While sailing between several isles and rocks, pay attention not only to the rocks, many of which are not visible, but also to the sea traffic which in summer period reaches great proportions. The island of Basiluzzo ,situated round 2 miles away from the promontory of Peppamaria in the north-eastern direction, has a dimension of circa 1km of length from east to west, 500 m from north to south, and is the major of the satellites surrounding the island. The island at maximum reaches a height of 165 m, and quite the whole coast line is abrupt and inaccessible, except a small piece of the beach next to the eastern point which allows the small boats to moor. From this beach an ancient and subjected to landslides path climbs till an open space, where the ruins of an ancient Roman villa are situated, with mosaic floors and multi-coloured walls; moreover for the fond of depths at 7,5m of depth near the small bay you can see the ruins of the old boat house of the Roman period. From the isle’s peak it is possible to admire the sunsets upon Stromboli and Panarea. To the west, near Basiluzzo, there is Spinazzola rock, a charming rocky formation, no more accessible, but where it is possible to dive into clear waters. Lisca Bianca, an enormous rock situated at circa 1mile to the east from San Pietro village. Its dimensions do not exceed 300m of length and 150m of width, and the height of round 30m. Its whitish colour which gave the name to the rock is due to the already vanished activity of fumarole, which however continue their gas emanation at a few metres from the island; a great scene for those who like snorkelling. They can also visit the Grotta degli Innamorati (Cave of the Lovers) , and perhaps, according to tradition, seal their love with a kiss. Dattilo, situated to the west of Lisca Bianca, between this one and Panarea, is slightly inferior in length, compared to the last one, and stands out for its pyramidal shape; its peak arrives to 103 m of height. Rocky coasts are interrupted by small gaps and caves; the western part is more rocky, and there are the rocks of Guglia di Dattilo, while on the eastern side the coast is made of steep slopes. Bottaro, the third as dimension, is situated to the south-west of Lisca Bianca, and is mostly visited because of gas emanations from the seabed, giving life to a suggestive scenery only few meters towards north from this isle. La Sorgente dei Quadrati creates a unique landscape; carbon dioxide and sulphide hydrogen from the depth reach the surface making the waters boil. Lisca Nera, a small rock of the elongated shape, a hundred of meters long to the south-west from Bottaro, stands out from other rocky formations of dark colours which surround Panarea; this is the origin of the name. Panarelli e Le Formiche, two groups of rocks located respectively to the north-west from Dattilo, and to the west from the coast area of Milazzese promontory. Pay attention because they are hard to see.